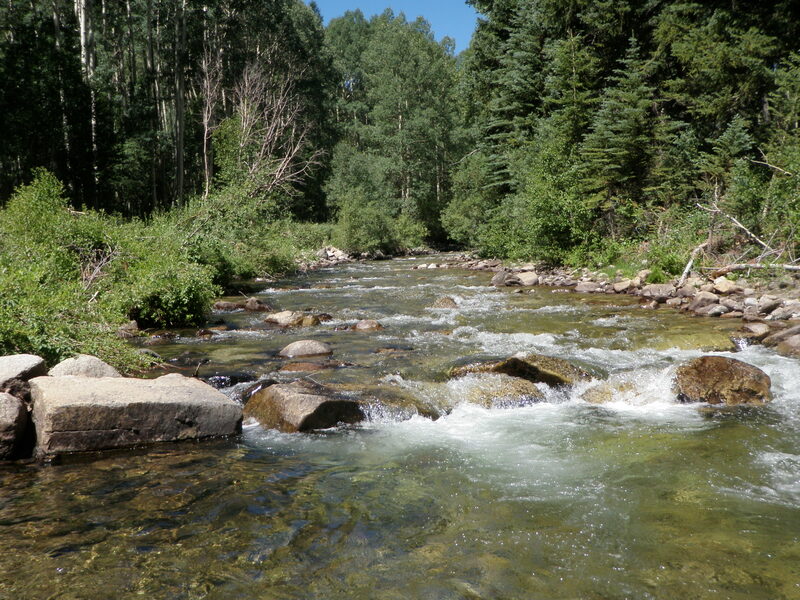 Jane and I had tickets to the Rockies game on Wednesday night, so I couldn’t travel as far as the Arkansas or Colorado to fish, so I chose to try the North Fork of the St. Vrain in Rocky Mountain National Park. 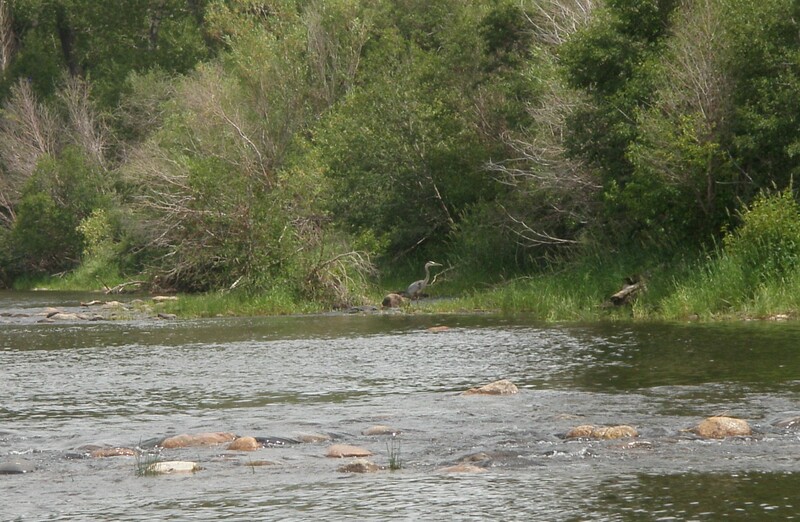 In previous years I’d had some fine outings at this time of year on the St. Vrain. I arrived at the park entrance around 9:15 and parked across from Sand Lake just inside the entrance gate. I began fishing at around 9:30. It was still overcast and a bit chilly with some dark clouds to the west, so I wore my raincoat in the morning. I started at the RMNP border at the bridge over the road that is outside the park. As it turns out, I am not fond of this water. It is wide and shallow much of the time with few good areas that hold fish. 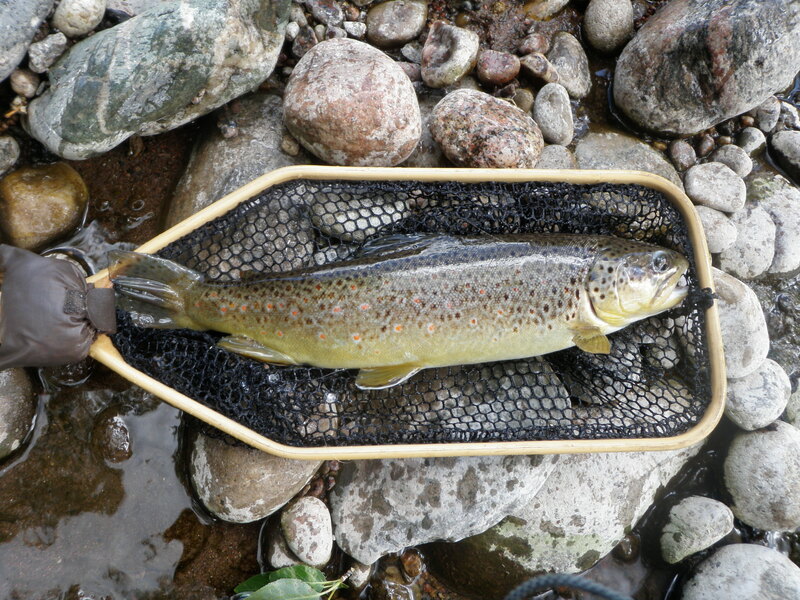 I covered quite a distance and landed four trout, one brown and three brook. 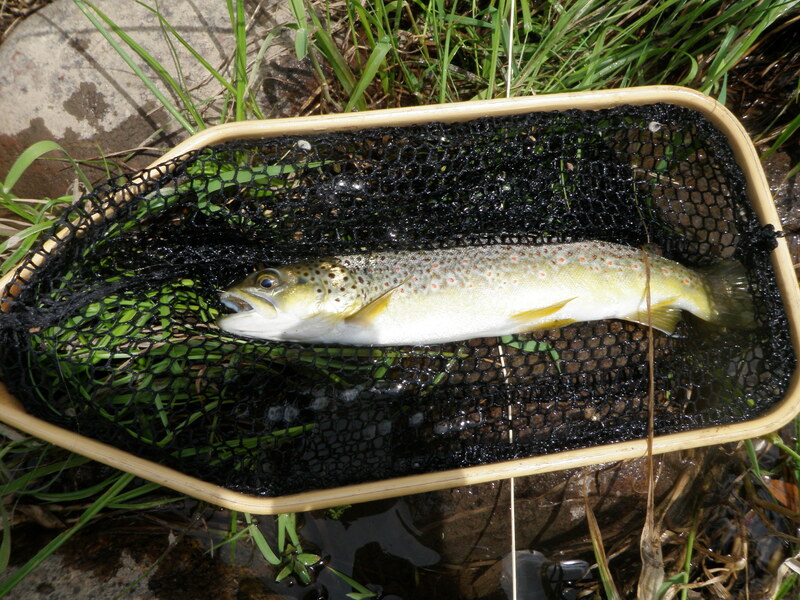 The brook trout tend to hold in slow moving areas with very little current. I was using a Chernobyl ant and caught the first couple on it, but switched to a lime green trude at some point. I recall catching one on the trude and the others on the Chernobyl. At around 10:45 I reached a long beaver pond and there were numerous sporadic rises. I cast my lime green trude and let it sit for the next 15 minutes or so. I had one refusal and that was it. I grew weary of the waiting game, so backed out away from the pond and retraced my steps and found the path back to the car. I drove further into the park and was stopped by a ranger telling me that the parking was full and I needed to park at the location where stopped. This was fine as I was close to the stretch of the stream where I wished to fish. I munched down my lunch as I sat on the tail of the minivan. Once I’d finished lunch, I gathered my fishing gear and hiked the horse trail to a spot just downstream from a bridge. Here I began the quest with the lime green trude still attached to my line. In the long pool just below the bridge I landed another brook trout on the trude. In a pocket nearly under the bridge a decent fish rose and floated under the fly, then took it, but I hooked the fish only momentarily. I had switched back to the Chernobyl ant as I was dissatisfied with the productivity of the trude. I advanced above the bridge and hiked up the path on the right side a ways as the water was fast with minimal holding spots. When I re-entered, I began prospecting with the Chernobyl ant and picked up fish fairly consistently. I was having great fun moving upstream and plopping the Chernobyl in the likely locations of fish. I began spotting occasional green drakes and other smaller mayflies emerging in the dappled light created by the sun overhead and the shade of the trees. When I’d caught and released twelve or so trout, the effectiveness of the Chernobyl seemed to wane, so I tied on a green drake comparadun. I should have done this sooner. In a stretch where the water hadn’t produced a look to the Chernobyl, three fish emerged and smashed the green drake. One was too small to count, one got off early, and I landed the other one. The trout were obviously tuned into green drakes. Unfortunately, I discovered this at around 1:45, and I needed to quit at around 2:15 to hike back to the car and return to Denver at the appointed time to go to the Rockies game. I landed two decent browns on the green drake to put my total for the day at 14. On the way back down the road, I decided to make a couple quick casts to the pocket below the bridge where I’d experienced a momentary hookup earlier. 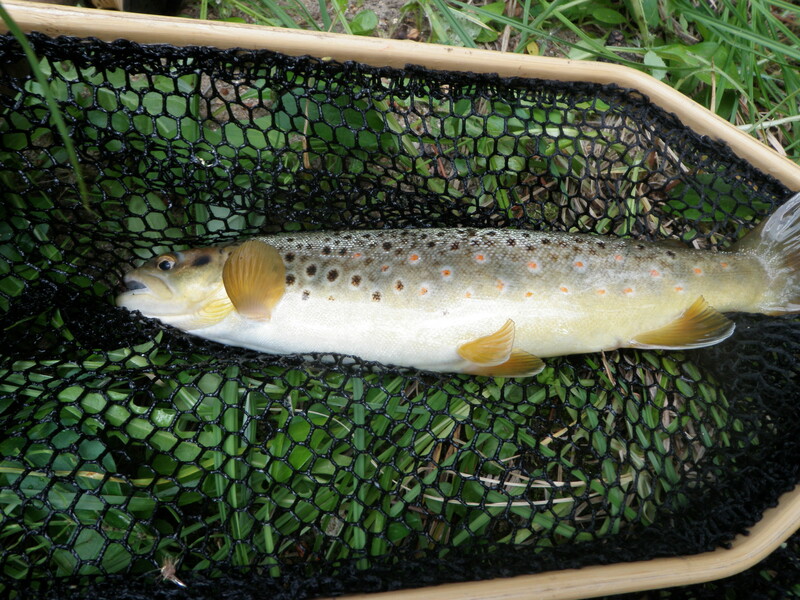 On the first cast, the nicest brown of the day emerged from the shadows and inhaled the comparadun with confidence. I landed and released the brown as a parade of horseback riders passed me on the bridge above. They complimented my catch, and I basked in the adulation of the tourists. When playing tennis with Dan on the weekend, he asked whether I’d be interested in fishing the South Platte some night after work. I replied that I needed to check the conditions on the South Platte, but I was definitely interested in some after work fishing. I checked the South Platte and flows were elevated to 366, but not coming from the bottom of the dam, and the previous week, while they worked on the dam, the flows were cut to a low level during the heat wave. Flies and Lies shop took temperature readings in the low 70’s. I decided the South Platte probably wasn’t a good choice as conditions were fluctuating too much. I emailed Dan and told him the South Platte probably wasn’t a good choice, but I’d had a blast on Clear Creek, and that was only an hour away, so why not give that a try. He replied that he was in, and could we go on Monday after work. I loaded the car and picked Dan up at 5:15 and we drove to the Philadelphia Mills open space and parked a bit west of my Friday venture. There were several other fishermen that we worked around. We crossed the bridge and went down the road to the midpoint of the area I’d fished on Friday. I tied a Chernobyl Ant on for Dan, and he began fishing the likely pockets. I didn’t tie on a fly until Dan had been fishing for an hour or so. Dan landed a couple decent trout by Clear Creek standards in the first hour on the Chernobyl. He followed his fly and saw the trout take and set the hook. 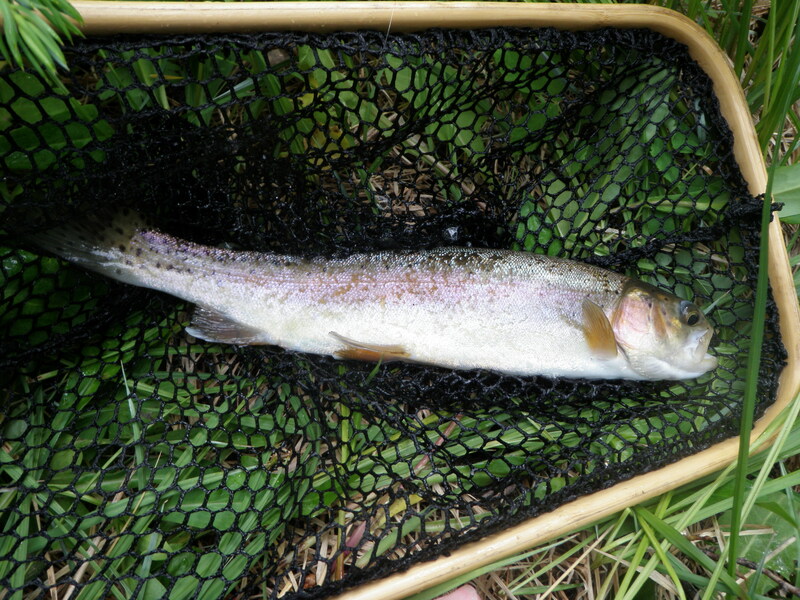 He was doing quite well, so I tied on a caddis and began fishing in parallel with him. I was still helping him a bit and netting the fish for him, so I was fishing sporadically. When we reached one of the fishermen, we skirted him and re-entered the stream 40 yards further upstream. Dan caught another rainbow along the left bank in the glare, and I was quite impressed. I still wasn’t having luck, so I swapped the caddis for a royal stimulator. The stimulator brought a few refusals, but still no fish. We encountered another fisherman, so once again went around and under the bridge near where we parked. We went upstream from the bridge quite a ways while prospecting some narrow slots along the bank with no success. Finally near the bend where the creek widened out a bit, Dan landed a fourth brown that he hooked when he felt it as he couldn’t follow his fly in the low light and glare. When we got to the wide area at the bend, there was a smooth pool on the far side. I spotted a fish working on the surface so I waded into position across from the pool. I had switched to a Chernobyl and tossed five to ten casts in the pool and had several refusals. It was now getting pretty dark at 8:30 or so, so I used my headlamp and switched out the Chernobyl for a light gray caddis. I couldn’t see my fly when I resumed casting, but watched for a rise in the vicinity of where I thought my fly was. I hooked and landed a tiny no-counter towards the top third of the pool. Dan was laughing at the minnow as I released it. I dried my fly and cast toward the middle and above where I’d seen the initial fish working. I felt a tug and set the hook and landed a 9 inch brown to prevent a skunking. We both decided to head back to the car over the boulder field while there was still a glimmer of remaining light. On Friday morning I returned to work and finished the commentary package for June. I left work at around 11AM and returned home. I’d left my fishing gear in the car hoping to get a trip in to a closer destination that allowed me to return in time to accompany Jane to pick up Dan at DIA as he returned from three weeks in China. 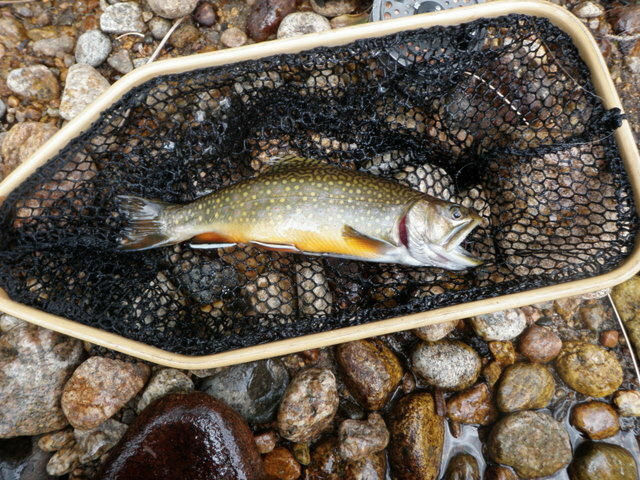 Originally I was considering the North Fork of the St. Vrain at Wild Basin within RMNP, but I wasn’t going to depart until around noon, so that crimped my fishing time. 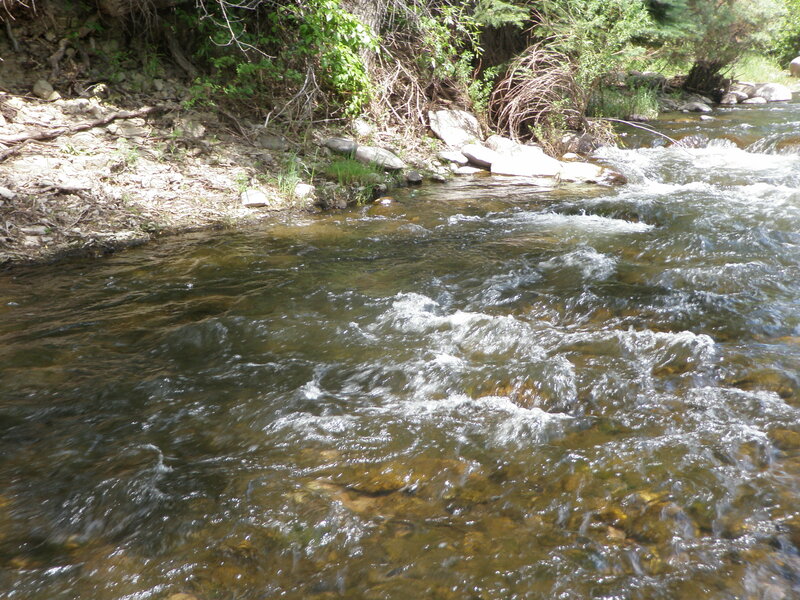 Next I considered Bear Creek, Boulder Creek and Clear Creek. I could make it to each of these destinations in an hour or less. I’d read reports on the Orvis store email and on Blue Quill Anglers recommending Clear Creek as a decent nearby fishing destination. I called Blue Quill Anglers, and asked Chris, the young man who answered the phone, for a recommended stretch of Clear Creek. 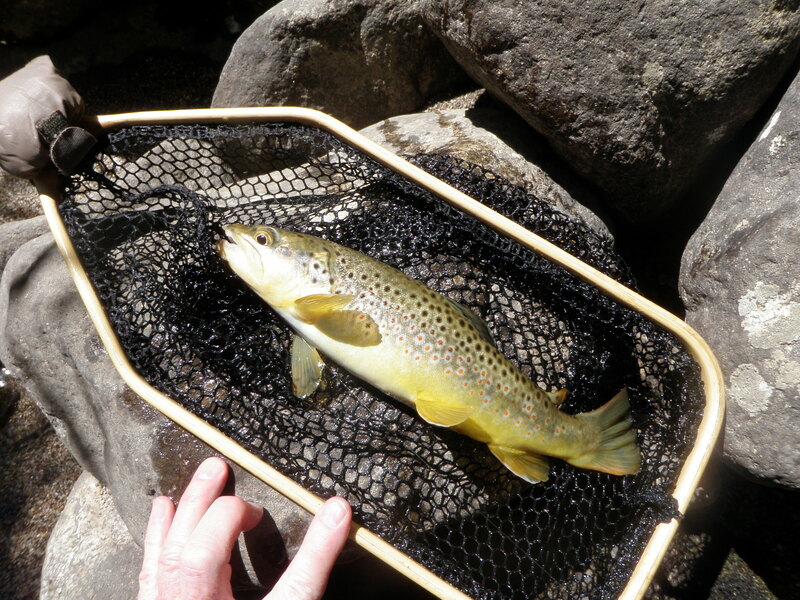 He pitched the Clear Creek Canyon stretch between Floyd Hill and Golden, but he fishes it in the evening. Since it was a very warm day again with minimal cloud cover I decided to drive further west beyond Idaho Springs to an area called Philadelphia Mills Open Space. I’d fished here several years ago. I parked on the eastbound side of the Frontage Road and began fishing at the eastern edge of the open space. I tied on a Chernobyl Ant and landed a brown and cutbow from the first two deep slots I tried. 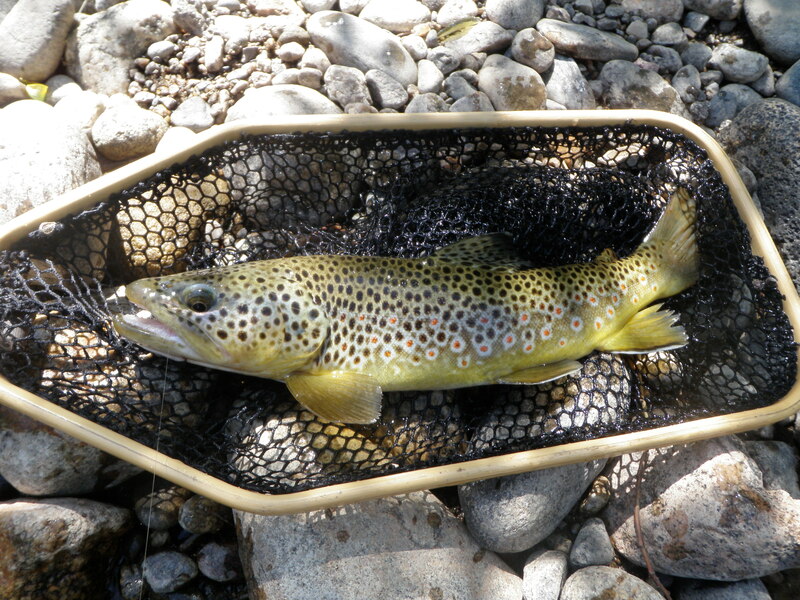 This hot fishing continued for the next three hours as I landed 13 trout, three bows and the remainder browns. All fish were in the 6-10 inch range, but quite feisty. At around 2PM, I began to notice sporadic green drakes taking off, so I tied on a green drake comparadun and prospected the likely locations. This produced three trout, but then I experienced a dry spell so I reverted to the Chernobyl. Once again the Chernobyl came through and I picked up the remaining six trout. At around 4PM the action slowed considerably so I decided to experiment and drive back down I70 toward Denver and try an area east of Idaho Springs. I exited at Hidden Valley and then turned left and drove .2 miles on the frontage road to a place where it dead ended, and a bike trail began. I parked and grabbed my rod and hiked down the bike path .2-.3 miles or so to a place where the stream fanned out a bit from the narrow fast chute that characterized much of the stretch. I began working some deep slow areas between the bank and stronger current. I spotted a brown holding in the water three feet behind a boulder and tossed the hopper/dropper above it, but there was no interest. Since I’d sighted a fish, I decided to switch flies and try to entice it. I removed the hopper/dropper and tied on a lime green trude. Once again there was no sign of interest. 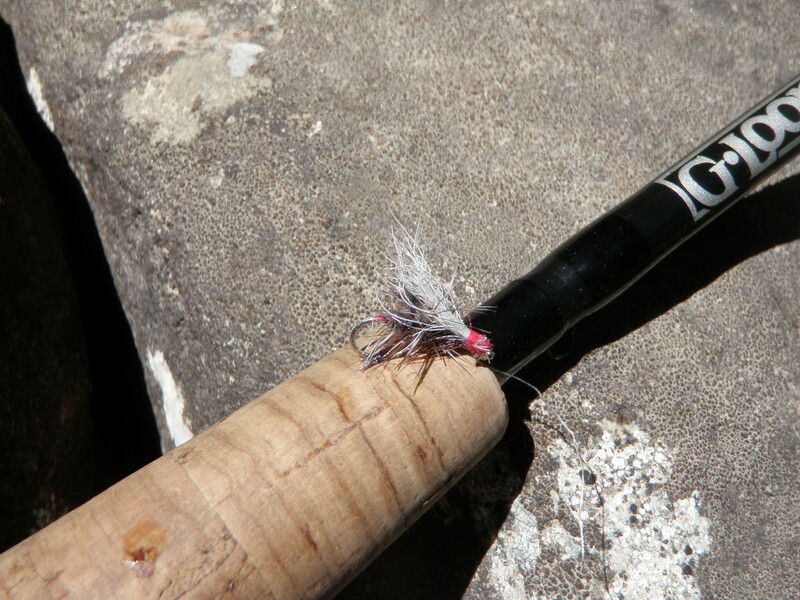 Next I clipped off the trude and tied on an olive-brown deer hair caddis. On the third drift the brown drifted up and sipped the caddis. After releasing the fish, I moved up 5-8 feet and began casting again. Once again I spotted a trout hugging the bottom. This fish was demonstrating no interest in the caddis. I decided to try something different and tied on the royal stimulator on top and trailed the caddis. On my first cast I created a serious tangle between the two flies. As I was untangling my mess along the edge of the stream three rafts went by and pulled in to the bank just below me. I could still see my target fish. But then a flotilla of rafts, perhaps five, came down the rapids and pulled in practically next to my elbow. Occupants jumped out of the rafts, and the guides encouraged them to climb the bank and jump in the creek and float the rapids in their life jackets. While I was untangling, one of the guides asked me how I was doing. I replied that I was doing pretty well until they arrived. He told me that unfortunately this was the only slow spot on their drift and, therefore, they were going swim here. I replied that didn’t do me much good, and climbed the bank and hiked upstream beyond the narrow chute stretch. 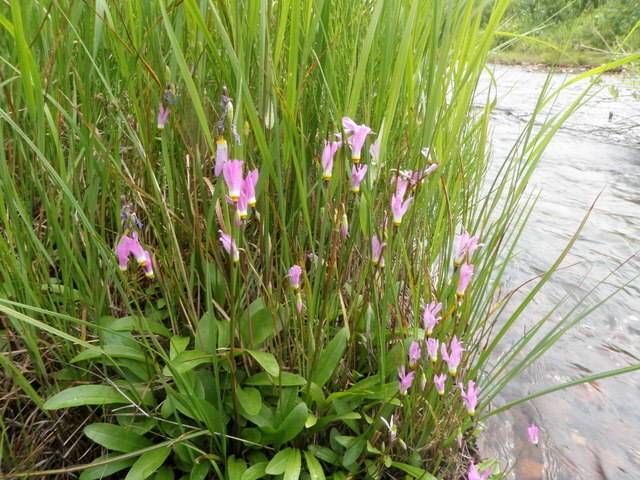 Once I untangled, I continued prospecting some nice water and no additional rafts appeared. I landed two more trout in the 7-8 inch range and when I reached the minivan, called it a day. I almost finished all the June closing work by Wednesday, July 21, with a couple hours of work remaining. I decided to take off on Thursday to make a longer fishing trip because I had to be back on Friday to pick Dan up at the airport from his trip to China. I wanted to try the Colorado again as I hoped the PMD hatch had begun, and I didn’t want to miss any of this hatch action. The forecast called for cloudiness in the afternoon with the threat of thunderstorms. I got off to a nice early start and arrived at the first fisherman access west of Parshall and began fishing at around 10AM. There were a number of cars in the lot, but not full like occurs when the fishing is very hot. When I got to the stream by the handicapped platform I could see two separate fishermen positioned near where I hoped to fish. I walked down along the north bank and crossed below the island across from the platform. The mosquitoes were intense and swarmed around my arms and head in spite of a heavy dose of high percentage DEET. I fished up the smaller channel on the far side of the island with a yellow Letort hopper and beadhead hares ear and landed one small brown trout. When I got to the top of the island I crossed and fished the nice run and riffle opposite the platform. One of the fishermen was 30 yards above me, and I didn’t want to crowd him. I didn’t have any success so switched to a double nymph set up with a strike indicator. I tied on a beadhead hares ear and put a beadhead pheasant tail on the point. This didn’t produce any fish, so I crossed back over below the island again and hiked upstream along the bank to an area where I’d previously seen many fishermen. There was a wide riffle about 3-4 feet deep and I probed this water with the nymphs and again had no action. Next I walked back along the bank toward the parking lot and stopped opposite the second fisherman who was now working the far bank area. I didn’t want to get too close, so decided to break for lunch at around 11 and went back to the parking lot. I felt constrained on where I could fish, so decided to drive to the second access, and see if there was more open water. There were a couple cars in the lot, and I walked out along the high bluff so I could look back up the river to the sweet spot where I had previous success. I didn’t see any fishermen there, so I returned to the car and ate my lunch. After lunch I hiked out along the ridge, then down the steep hill, then turned left and went up along the north side of the river to the targeted run and pool. When I entered the river at the tail of the pool and looked up, two fishermen were sitting on the bank. I’d spent all this time to get to the desired area, and now it was occupied. Meanwhile I spotted several rises at the lip of the pool. I looked closely and saw a few PMD’s floating on the surface, so I tied on a size 16 light gray comparadun, my go to fly for PMD hatches. On perhaps the third cast of the comparadun, a spunky 13 inch brown rose and sucked in the fly. I continued casting where I saw rises, but couldn’t entice anymore fish. The hatch only lasted 15 minutes at most. What should I do now? Would it be bad manners to cross to the opposite bank and fish across from the two fishermen who by now had returned to fishing the pool? I decided to cross and see how they reacted. I walked up along the far bank and went above them by 30 feet or so. I didn’t get a good feeling about fishing close to them, so I moved upstream beyond the long run and pool. 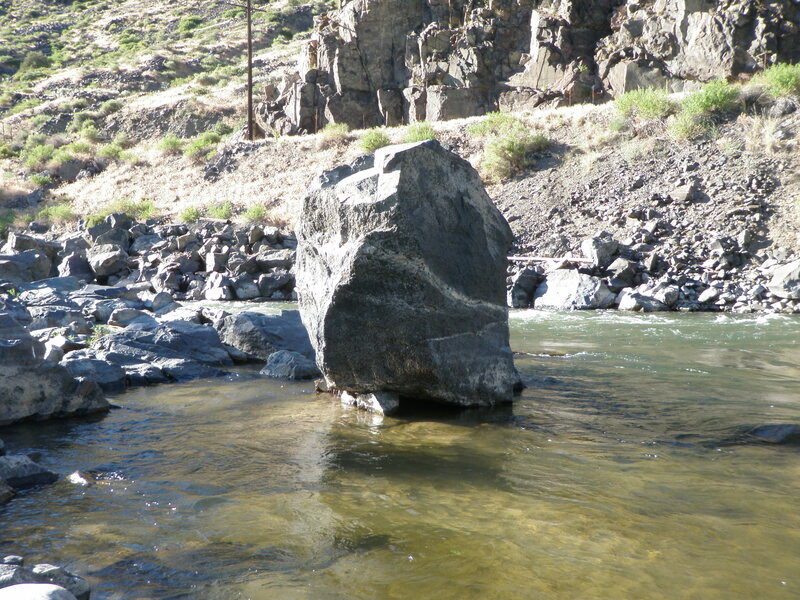 Between the long run and pool there was a succession of three or four sections where the current tumbled over some rocks then flowed on an angle toward either bank. I removed the comparadun and tied on a size 14 yellow sally as I’d noticed quite a few dapping the water. I caught a small rainbow on the yellow sally. I was also noticing occasional caddis dapping the water, so I tied tippet on to the bend of the yellow sally and added a light gray caddis and fished a two dry fly setup. I systematically worked my way through the next three stretches of riffle/runs prospecting with the two dry fly configuration and landed six nice brown trout mostly ranging between 13 and 15 inches. Four inhaled the yellow sally and two others attacked the caddis on the end. Most of the action occurred at the tail of the run or at the head of the run. It wasn’t total blind casting as I spotted occasional subtle rises, and when I did, I placed my flies in the vicinity of the rise, and was typically rewarded. I’d reached nine fish caught on the day and approached the bridge separating the first access area and the one I was currently in, so I exited and hiked across the bridge then back down route 40 to the parking lot. Some nasty clouds were brewing to the west, so I put on my raincoat and returned to the river, this time going right and reaching the long pool where I’d had so much success the previous summer. I prospected the riffles, the far bank, and the eddy around some rocks on the far side at the top of the pool, but had no success. The wind started gusting and sheets of rain burst from the sky, so I retreated to the bank and stood and watched the water as it was pelted. I did this for five minutes or so hoping to see some sort of hatch instigated by the overcast conditions, but nothing was changing, so I reeled up my flies and called it a day. 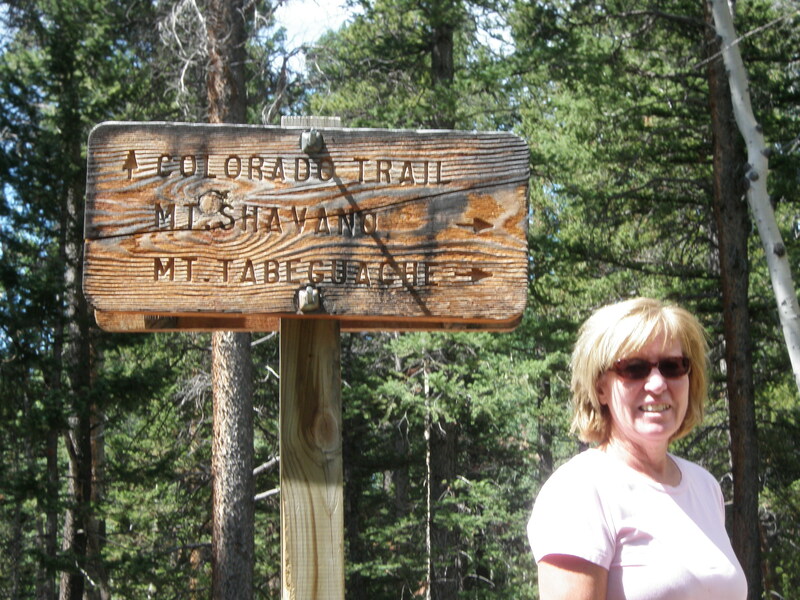 It was forecast to be another hot day, so I decided to hike the Colorado Trail with Jane to the Blanks cabin in the morning, and then fish in a small headwater stream in mid to late afternoon. Jane and I got off to a nice early start and actually went beyond the Blanks cabin to the turn off to hike to the summit of Mt. Shavano. It was quite an accomplishment two months after hip surgery. When we returned to camp we put up the canopy as some dark clouds were building in the west and then we had lunch and lounged a bit and read. I gathered my fishing things and left the campground at around 2:30 and drove to Fooses Creek. 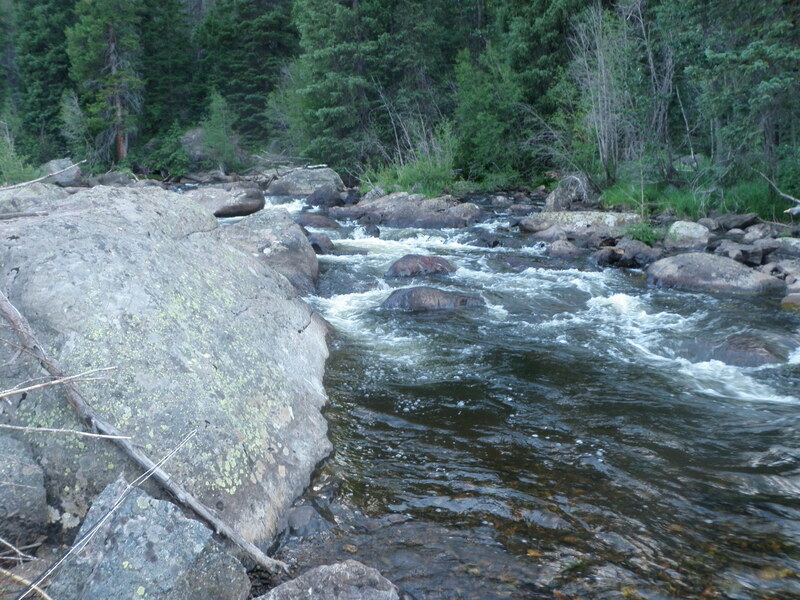 Fooses Creek is a small tributary to the Arkansas River that begins near the Continental Divide near Monarch Pass. I’d fished it once before many years ago. It was a short drive from the campground to Route 50 then up the highway a few miles then a mile or two on a dirt road south of 50. The stream flows into a small reservoir, and when I crested the hill and saw the reservoir, there was no where to park as the lake was surrounded by fishermen. I later learned that the lake had been recently stocked. I performed a three point turn and parked in a lot below the reservoir. After putting on my fishing gear, I climbed back up the hill to the lake. The sky was quite cloudy and a welcome relief from the last week of bright sunny days. I spotted quite a few fish rising in the lake, but moved on to the inlet as I’d targeted the stream. When I reached the inlet, I could see a fish rising and taking something right in the current where the stream entered the lake. I tied on an olive body deer hair caddis, and quickly hooked up on a fish, but it got off just as quickly. Next I spotted a rise where the stream dropped off into deeper water in the lake. A longer cast brought a fish to my fly, and I had another momentary hook up. I reminded myself that my goal was to fish the stream, and retrieved my fly and moved on. At this point I ran into a couple fishermen coming down the road to the lake with fly rods. I asked if they’d disturbed the stream, and they asked me if I fished it before. I replied that I had, and they said, “Then you know there aren’t that many fishable spots, so we didn’t disturb much.” I decided to press on. Fooses Creek is quite narrow, probably five feet wide in most places. It tumbles down at a fairly steep gradient and there is much streamside vegetation, rocks and debris to hinder a fisherman. Some streams present a challenge of reading the water and finding fish and some offer the challenge of identifying insects and selecting the correct fly. The challenge of Fooses Creek is how to get a fly over fish without spooking the target. I used normal casts, bow and arrow casts, and dapping over the next 3.5 hours to land 12 trout. I used a Chernobyl Ant the whole time as it was very buoyant and I had minimal space for false casting to dry a fly. I had a blast. As I moved to each spot I had to determine how to position myself and then how to execute a cast in tight quarters. Once again, the small fish dropped off the fly as it was too big for their mouths. The fish I did land were typically 6-10 inches, but colorful and feisty. In many cases I spotted the trout and carefully presented the Chernobyl. In other cases, the take was a complete surprise. 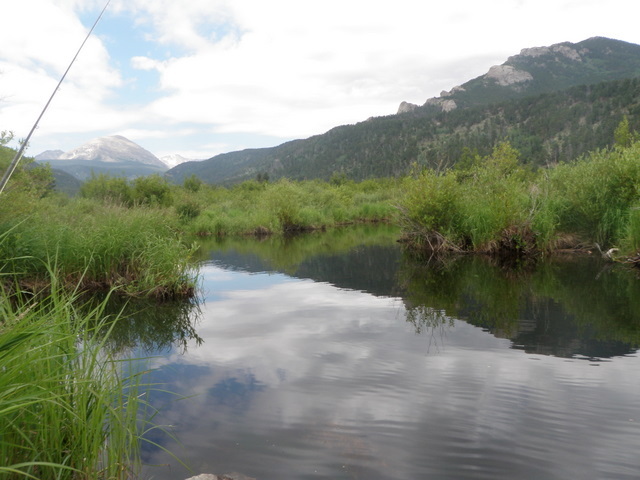 I caught numerous fish with the fly within two feet of the top of my rod as I reached the long rod above and beyond a possible trout lie, then brought the rod back at the same speed as the current. Of the twelve trout I landed from the stream, 11 were browns and 1 was a rainbow. I crossed the dirt road and fished the stream on the southeast side of the road a short distance. The clouds grew darker, and I could hear thunder and see occasional lightening. I decided to leave the stream and hike back to the lake with a half hour or so of time remaining before I needed to return to Jane at the campground to help prepare dinner. Quite a few additional stocker stalkers had arrived and pretty much owned the inlet area of the lake, so I moved to the north end along the road. I tied on the olive caddis and began sending out long casts to where I’d spotted rises. I learned that I needed to allow the fly to sit for what seemed like an interminable length of time, and a fish would eventually rise to it. I had quite a few refusals, but did hook up and land two stocker rainbows. The second rainbow actually nailed the fly as I stripped it slowly but fast enough to create a small wake. I thought this was the solution to catching more fish, but it was very inconsistent. The sky darkened considerably and while fishing the lake it showered several times. I put on my raincoat and fished on. After a half hour or so of lake casting, I called it quits and headed back to the campground. I returned home to Denver chastened by the July skunking on the Colorado River. The plan was to shower and get a good night’s rest, then add camping gear for Jane to the van, additional food for the weekend, and drive to Angel of Shavano Campground on Friday and secure a camping spot for Jane and me for the weekend. I got off to a nice early start because most of the fishing and camping gear were already packed. I decided to stop and fish Chalk Creek, a tributary to the Arkansas, as it was along the way to Angel of Shavano. I drove along Chalk Creek and passed Mt. Princeton Hot Springs. 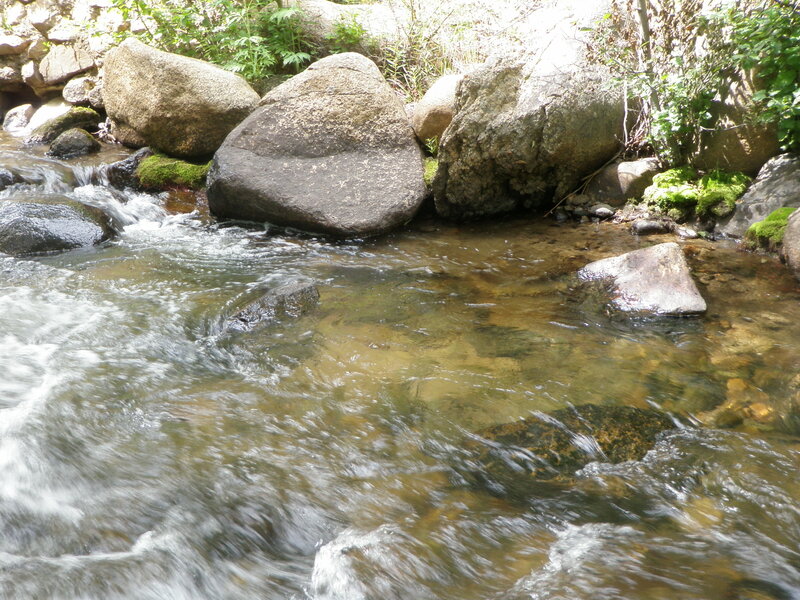 The stream was clear and appeared to be ideal for fishing. I backed into the large pullout beyond the bridge a half mile or less after the paved road converted to dirt. This is where I began my quest to catch a fish. Looking back on the past two days, it was clear that I was doing better in the higher elevation feeder streams than in the major rivers in the valleys. Was this a function of the elevation or the time of day I was fishing? I’m guessing it was some of each. At any rate, I planned to test the theory by fishing Chalk Creek from 10 until early afternoon, then snag a campsite, then hit the Arkansas for the evening. Initially I tied on the Royal Stimulator that had served me well on Brush Creek and Homestake Creek. I added a beadhead hares ear dropper. This combination produced immediately, and I landed 10 browns in short order. Eight smashed the stimulator and two grabbed the trailing nymph. But the stimulator was beginning to lose its wing material, so I decided to replace with a durable foam Chernobyl Ant. The Chernobyl Ant is a great choice in small headwaters as it is durable and floats without false casting. It proved to be a great choice. I flipped the Chernobyl in all the likely spots and landed fish after fish as I worked upstream a mile or so. In fact, the fly was too large for the smaller trout to get in their mouths, so I experienced numerous bumps or momentary hookups, and only landed the larger fish. Of course larger in this water translates to 9-10 inches maximum. But it was great fun prospecting and wading upstream and popping the Chernobyl in all the likely spots. I called it quits at around 1PM in order to hustle along to Angel of Shavano and secure a spot for Jane and me for the weekend. I drove to route 50 and turned right at Poncha Springs and headed west then turned off and drove the remaining six miles to Angel of Shavano. There were three remaining open campsites, so I quickly paid for and secured site 17. 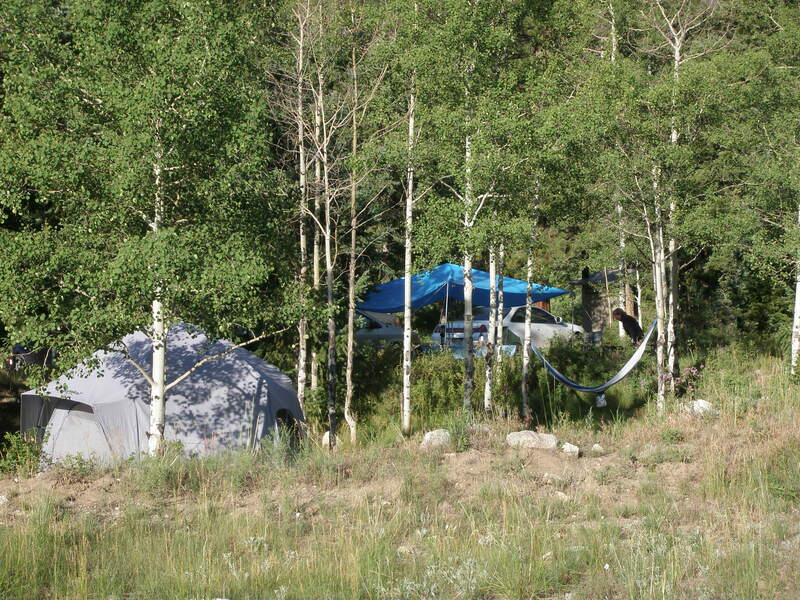 We’ve used 17 numerous times and like the shallow wide trough between two natural berms where we set up our tent. It was extremely hot as I set up the Eureka tent and attempted to stash the cooler and food bins in shade away from the direct sun. I wanted to leave the food at the campsite in case Jane arrived from Denver before I returned from fishing. I was off and driving to the Arkansas River by around 3PM and on the water by 4PM. 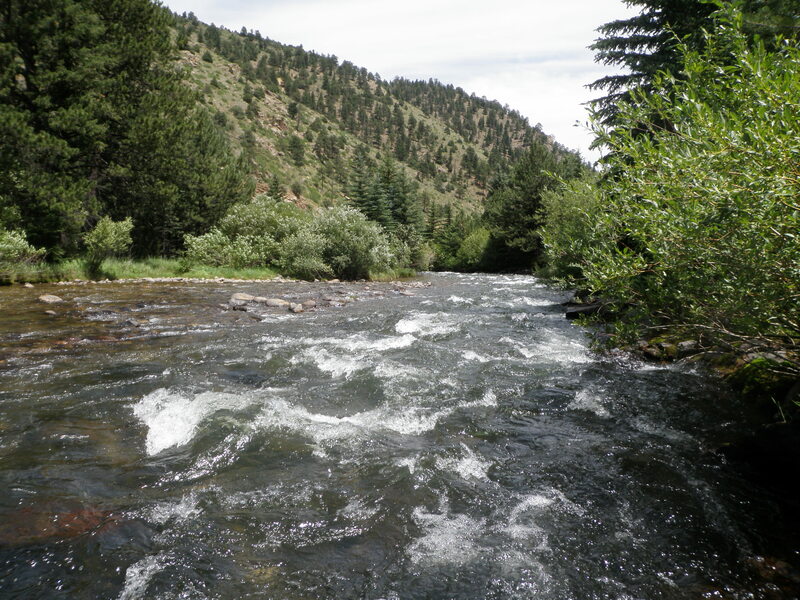 I chose some water east of Salida where there is some nice pocket water on the highway side of the river. 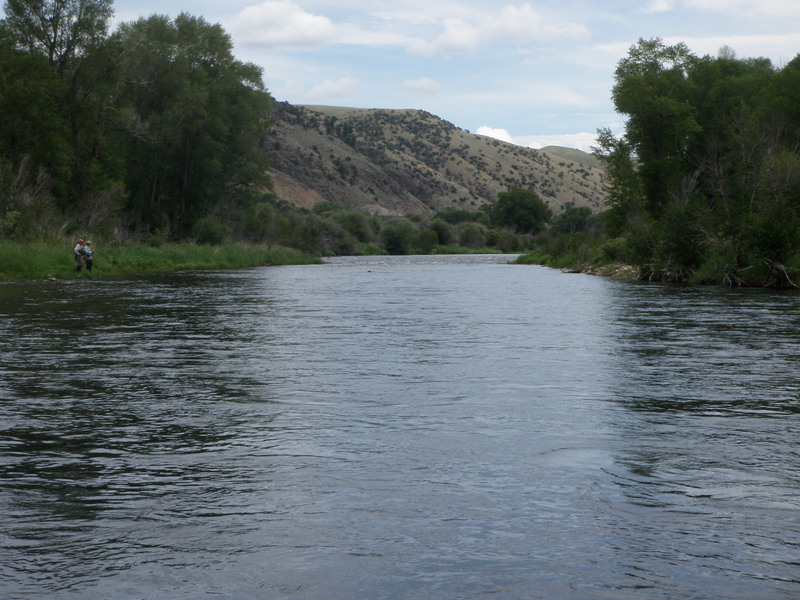 I figured with the heat, the fish would be attracted to the oxygenated pocket water, and the flows at 775 cfs were too high for crossing to the opposite bank. I initially tied on a yellow Letort hopper and beadhead hares ear, the standard default beginning fly choice. I managed to land one small brown on the BHHE as I worked the pockets along the bank, but I was doing a lot of casting with minimal results. It was absolutely sweltering, and I was perspiring as I waded through the shallow water and climbed the rocks along the bank. At one spot as I was passing a large boulder along the bank, I noticed quite a few caddis fluttering away when I leaned on the rock. I looked closely and there were many caddis tucked in the crevices and cracks on the rock. I pinched one and observed a dark olive/brown body. I continued on and clipped off the hopper/dropper combination and tied on a lime green trude. This produced a second small brown in one of the more attractive riffle stretches, but that was it. I also tried an olive deer hair caddis, but that didn’t seem to interest the fish anymore than the previous offerings. 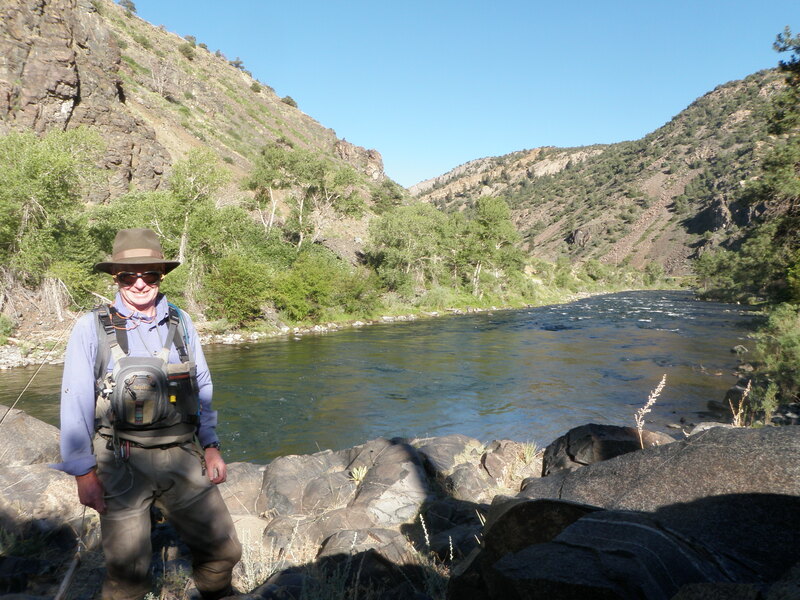 I had now lost confidence in my ability to catch fish and the heat was really sapping my energy, so I hiked further upstream through an area that I’d never fished before. I was searching for an exit path up the steep bank between the river and highway that was covered with dense vegetation. Eventually I found what I was looking for and a nice path led me on a gradual angle up the bank and terminated by a pullout next to highway 50. I filed this location for future reference. 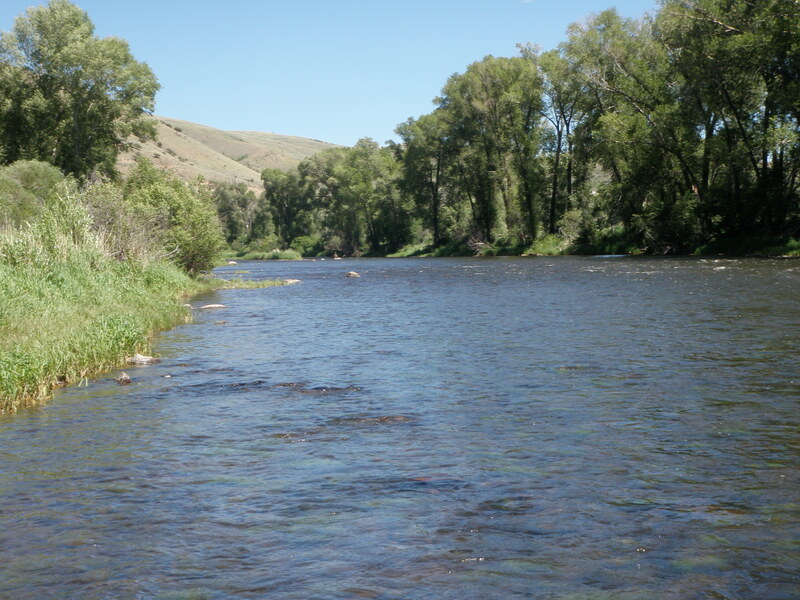 After my poor results on Wednesday, I could not foresee enduring another slow day on the Eagle River, so I decided to cut my losses and drive to the Colorado River near Parshall. The downside to this strategy was that I would spend the morning driving, and once again be on the river during the afternoon. Thursday was once again forecast to be a hot dry clear July day. I had to wait for the dew to dry on my tent before packing it up, so I didn’t leave the campground until around 9:30AM. It was still a two hour drive to the Colorado as I had to go north to I70, then east to Silverthorne, then north to Kremmling, then east to Parshall. When I arrived at the parking lot, there were quite a few cars there. I immediately applied DEET to ward off the insatiable mosquitoes and then ate my lunch at the picnic table in the center of the parking lot. After lunch I put on my waders and set up my rod and walked to the stream. There were some fishermen near the stretch I like, but enough space for me to enter at the lower end. I began fishing with the yellow Letort hopper trailing a beadhead hares ear. In short order I foul hooked a small brown that refused the hopper, but I set the hook and nailed it with the trailing nymph. I moved across the river, but was not moving any fish. As I cast repeatedly, I noticed quite a few yellow sallies descending to the water, then taking off again. I decided to tie on a size 16 yellow sally fly, and had no luck with this fly. I caught a natural out of the air in front of me and examined it. It appeared to be larger than a size 16, so I tied on a size 14 2XL lime green trude. This was close in size, but perhaps too dark in color. This didn’t generate any interest, so I found a nice yellow sally imitation with a quill body that I’d tied from A.K. Best’s Flybox book. This was a great looking fly, but again it did not produce. I was making all these fly changes as I crossed the river to the far side and worked my way up along the right bank covering the water from the deep mid-river run to the south bank. At one point after some strong gusts of wind, I noticed several trout rise, so I decided to fish a double dry fly with the lime green trude in front and a parachute ant on the end. 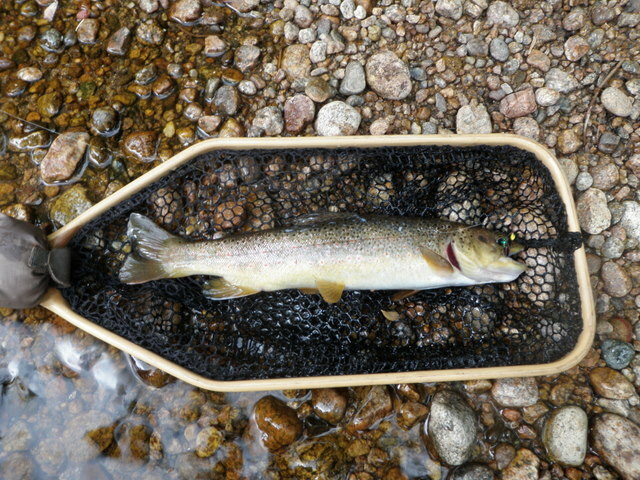 Two trout swirled to the ant, but refused to take it. I continued working the right side to the top of the sweet area. I did hook a fish that took off down the river toward the top of the nice area, but the fish got off as I tried to turn it and bring it back toward me. Toward late afternoon the sparse yellow sally action slowed down, and I’d reached the end of the area I desired to fish, and it didn’t appear that conditions were going to change, so I called it a day and headed back to Denver. I got skunked on the Colorado River in July. When I returned to the campground, I set up my two person REI tent and made my delectable dinner of chicken noodle soup and carrots and bread. After I cleaned up, I decided to fish Homestake Creek until dark. 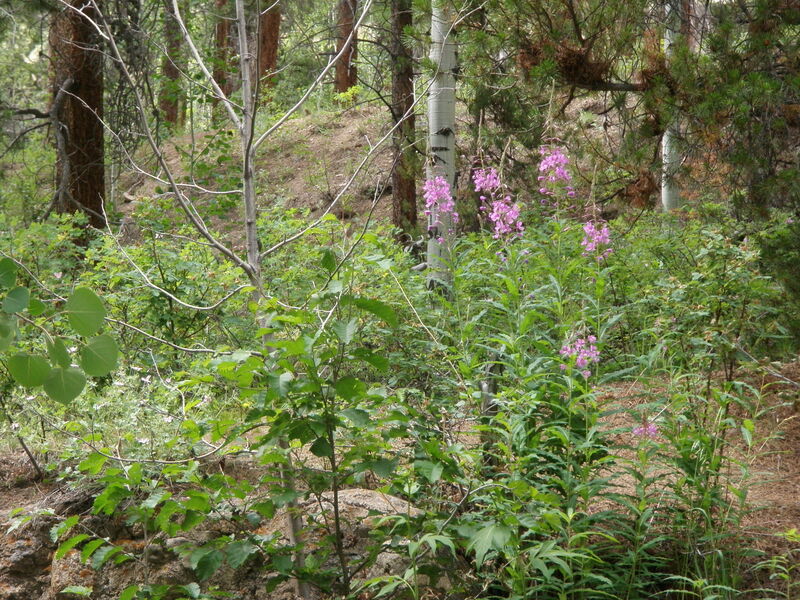 Homestake is a small tributary to the Eagle that runs directly across from the Hornsilver Campground. I drove downstream a bit toward where a side road angles off to the left from Route 24. I drove to the bottom of the hill where there is a big curve, and the stream was cutting deeper and deeper into a canyon. I didn’t want to scramble down a steep canyon late in the evening, so I did a U-turn, and parked half way back up the hill. The gradient was quite steep where I began with numerous plunge pools. 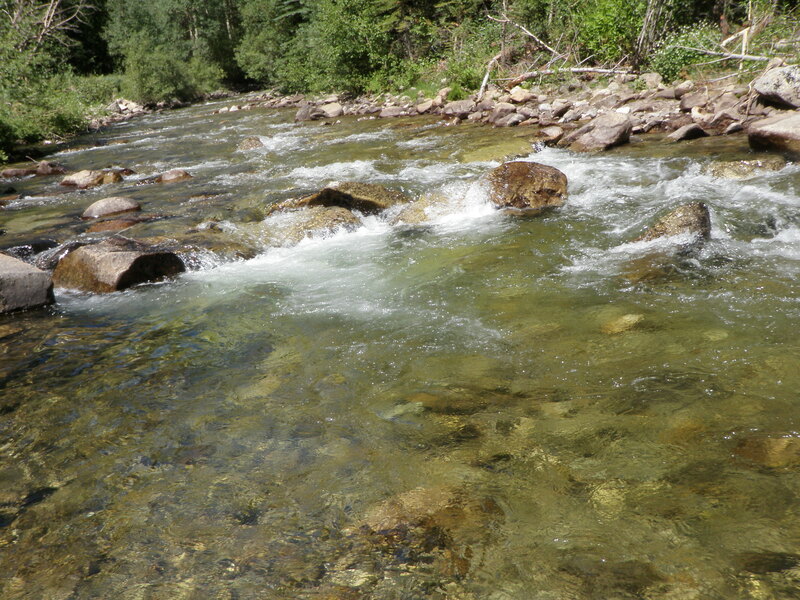 I tied on a light gray body deer hair caddis and caught three small browns in the plunge pools as I hop scotched my way from boulder to boulder moving upstream. However, the caddis stopped producing and it was getting progressively darker, so I switched out the caddis for the royal stimulator that had produced so well for me on Brush Creek. I picked up a few fish on the stimulator, but I knew there were more fish than I was attracting, so I added a beadhead hares ear under the stimulator. This proved to be a smart move and my catch rate picked up. The stream was narrow enough that I could cast to the slack water on the far side of the fast midstream current and reach my rod out and up and let the combination drift back through the juicy pockets and slack water without drag. More often than not, a brown would grab the trailing hares ear when I executed this technique. When I got to the portion of the stream where the road Y’ed away from Route 24, the gradient was less steep and the stream widened. By this time it was getting quite dark since it was approaching 9PM, so I called it a night and returned to my sleeping bag. I was itching to return to the Eagle River after some decent action the previous Friday near the rest area above the pedestrian bridge. Denver was in a heat wave and escaping to the mountains was an additional appeal. 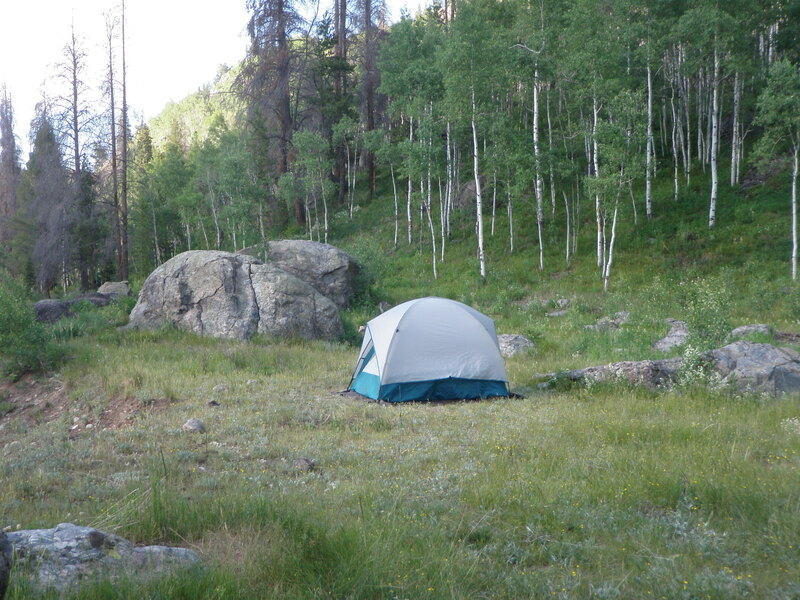 I decided to pack the van with camping gear and fish the Eagle Wednesday and Thursday and camp at Hornsilver high above Minturn. I got off to a reasonably early start and arrived at Hornsilver around noon. The campground was empty, so I grabbed site 4 and paid my fee, ate lunch and then headed to the Eagle. I arrived and was on the stream at around noon. I hiked downstream to the auto bridge next to the entrance to the rest area and began working the pockets tight to the left bank facing upstream. I picked up a small brown near the start, but that was all I’d catch over the entire stretch from the bridge to the long run/pool above the rest area. It was a very hot day with temperatures in the 80’s and clear, blue skies. I skipped past the stretch of water I’d fished the previous Friday and hiked behind the condos on the left around the bend with the pedestrian bridge and then beyond the next 90 degree bend near route 6. I began fishing again below the island and up the left smaller channel. I had been using a yellow Letort hopper trailing a beadhead hares ear, the combination that produced so well on Friday, but it wasn’t working on this day. I decided to experiment with some alternatives. Part way up the left channel I tied on a lime green trude and two-thirds of the way up the channel a nice 15 inch brown sipped it in. I battled the brown and landed it and photographed. I moved on to the top of the island and fished the nice pockets along the left bank and caught one more small brown on the lime green trude. That would be my count for the day, two small browns and one very nice fifteen inch fish. I was very disappointed. I had changed out my tapered leader at the start of the day, so decided to stop at the Alpine River fly show in Riverwalk and purchase a new one. I asked the gentleman behind the counter what happened to the fishing, and he said that fishing in the middle of the day when it is hot, is generally not productive. He suggested morning or evening and going deep with nymphs if I wanted to fish in the afternoon.